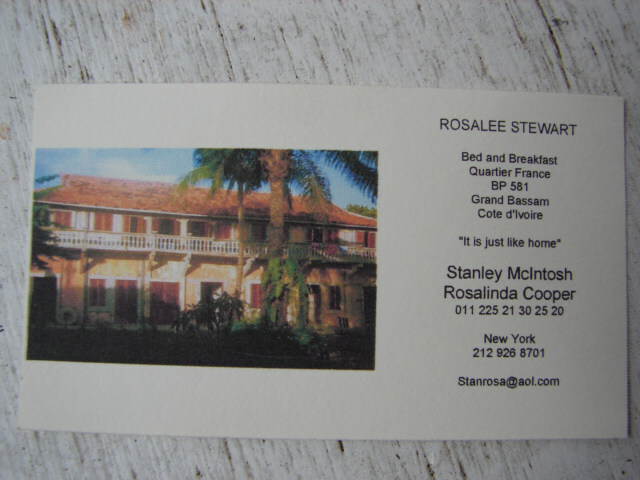 This is Rosalie, she is from Harlem, New York City, New York and has purchased a big old French Colonial type building and transformed it into a pleasant type bed and breakfast. It is maybe and island in the stream, where you could have some interesting conversations in English, when you are starved to relax on speaking French. The second floor is inspiring and has a good feel, quaint, family like and a good place for a older couple that needs to be separated and safer. 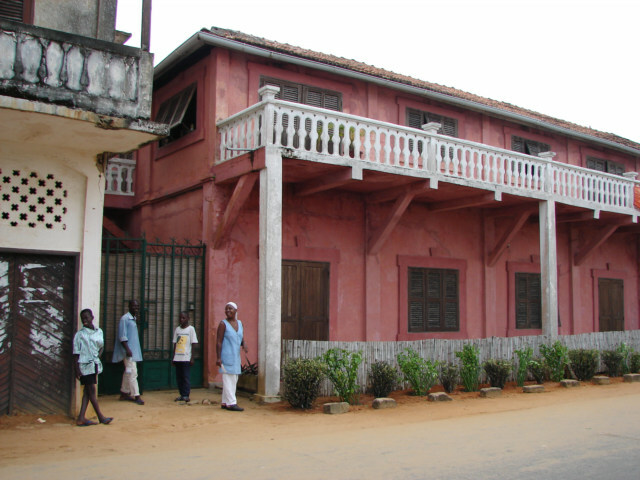 It is in the center of the Ancien Bassam, which to me is perfect because you can walk out the door and see something beside just the beach tourist crap. Most of the better hotels are too far from the Old French colonial area of Bassam and really make it impossible to walk around, you can still walk to the beach or go hang around in one of the swimming pools as this the real use of the hotel, you do not have to live in a hotel to use the pool. 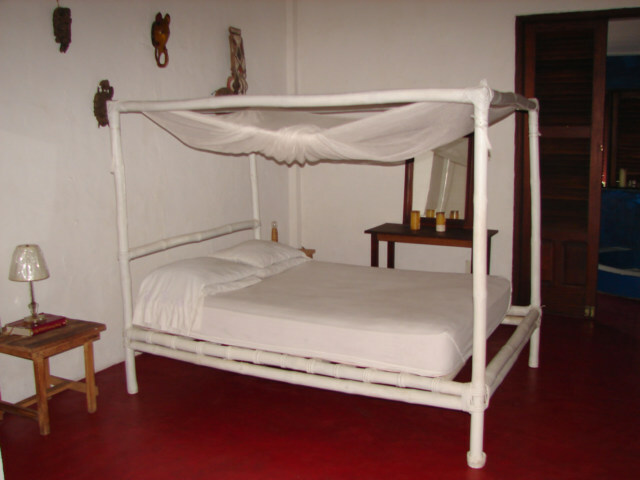 Complete with the mosquito nets, beds, carpeted and arts on the wall. 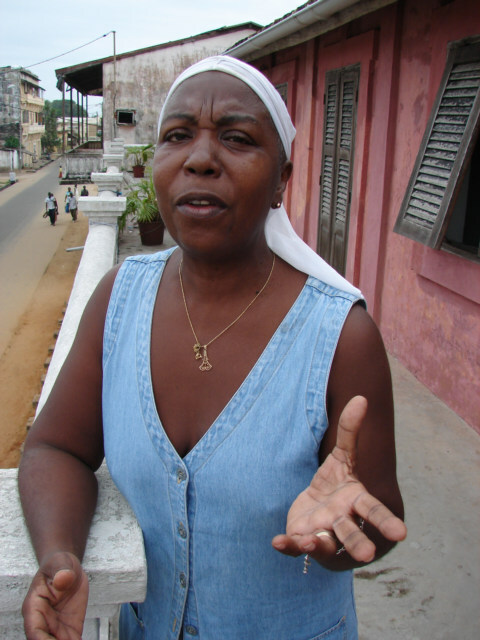 She is from Harlem, New York City and has a lot of vocal points on the black culture both in the USA and in Africa, she is a fun lady. Very outspoken and tells me often what I am already thinking, however as a white boy am not going to say. It is wonderful to listen to a black woman from the USA explain the contrast, differences, good and bad between two cultures. Blacks in the USA and blacks in Ivory Coast West Africa. I love her location, if she had a few girls up on the roof laying in the sun, it would be paradise for me, I could walk out and get a Benet or Gallet or whatever in the morning and talk with the locals easier than my present too far from the colonial section, but has a swimming pool Hotel. The price of the room is 50 Dollars U.S, my guess is you could work discounts. The cost of all the hotels in Grand Bassam is strictly go for the gusto tourist fare, nothing but the rich and wanna be rich will pay. I am here, paying to see the beach and see the colonial area of Grand Bassam, sadly I have only seen one other person walking around beside Rosalie in the 10 days I have been here. However, on the weekend many person come for the day on Sunday, I mean foreigners. Grand Bassam is a paradise of sorts, culture, beach, close to Abidjan city, safer than Abidjan and only a one dollar group taxi from Macory or Trechville. I am not recommending this Hotel, I have never stayed there, too rich for my blood, but if you needed an Englihs Speaking vacation, this may be the only place.